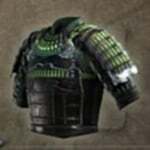 Nagake Armor: Do is a Torso Armor in Nioh. "Upper body armor in the Yokinoshita style coated with black lacquer. The brown chest plate provides additional protection, and indicates the wearer's allegiance. Part of a traditional armor set known as Tosei-gusoku in Japanese, this armor was worn by an elite group of warriors known as the Nagake, who took direct orders from the Date clan. The group consisted of marksmen and foot soldiers, who were used to guard leaders, assist military efforts, deliver messages, and perform various other duties."